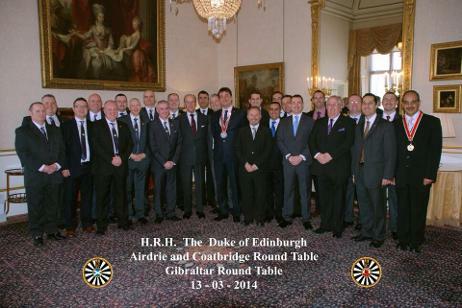 Round Table Gibraltar is proud to be twinned with Airdrie and District Round Table. When some members of Airdrie Round Table discovered that Gibraltar had been chartered by Hamilton Round Table, who in turn had been chartered by Airdrie RT, they made contact with a view to twinning. A relationship developed which made the members feel as if they had always known each other. We even had disturbingly similar members (both physically and in character) giving rise to rumours that Norbert and Hector were separated at birth. A twinning pin was produced at the time, and both Tables agreed that there would be an annual visit, the location of which would alternate between Airdrie and Gibraltar. 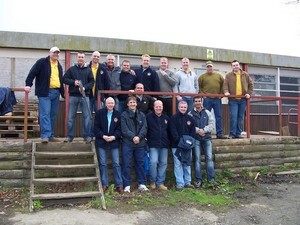 A sizeable Airdrie contingent visited Gibraltar during our March 2010 AGM and then subsequently in January 2011 for Round Table Gibraltar's legendary Burns Supper (photo above). 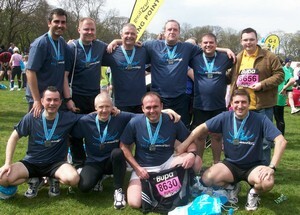 Prior to this a bunch of us travelled to Edinburgh to run a 10km charity run with some of our Airdrie friends. They, as always, indulged us with VIP treatment which included a karaoke limo, clay pigeon shooting, a day at a spa, and an invitation to a Civic Reception in Motherwell in celebration of their 50th anniversary. 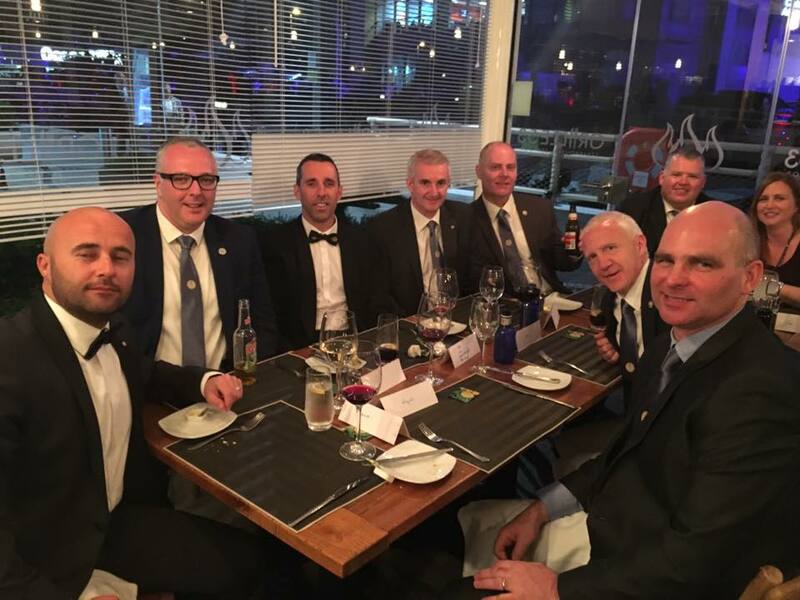 What was particularly special is that they invited our then President, Peter “the Accent Chameleon” Hyde, to sit at the Head Table with some of the local dignitaries. 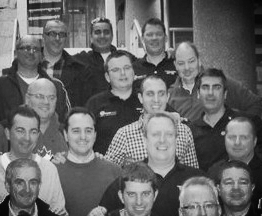 The relationship is going strong and a return visit was organised in 2011 when some of the local tablers assisted in a night marathon. Unlucky for them their return leg took over 24 hours! 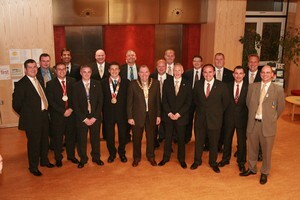 Earlier in 2013 we were visited by a sizable contingent for our Burns Supper. This involved a weekend and a day trip to Morocco which was superb. We had a brilliant return trip to Airdrie in June 2013 for their 55th Charter Anniversary and then in 2014 our relationship was celebrated in London in style with a visit to Buckingham Palace where we were granted an audience with Prince Philip. 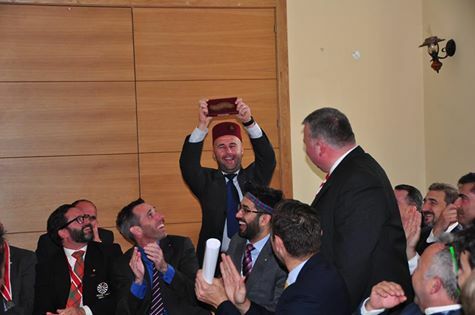 The most recent visit was to our own AGM in 2016, where the traditional "Dog Turd" was handed to Keith Chichon who is reposnible for keeping our reloationship thriving by ensuring its return in person to Aidrie and Coatbridge.